NEW YORK, N.Y. (September 26, 2017) ― Fortune magazine has included GROHE, part of LIXIL, in this year’s “Change the World” ranking. The list includes 50 international companies whose business strategies have a demonstrably positive impact on society. In their assessment, Fortune and its partners evaluated the quantifiable social benefit, economic viability and degree of innovation of different companies. GROHE is the only company in the plumbing industry to be included on the list. In its decision statement, Fortune explicitly commended GROHE’s extraordinary commitment to saving water and energy, as well as to avoiding waste. In particular, Fortune praised the recycling of 99 percent of the water needed to manufacture GROHE kitchen and bathroom faucets. 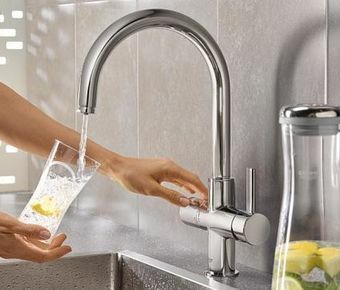 Specifically named in Fortune’s official decision statement is GROHE Blue, the kitchen faucet system that reduces CO2 emissions by 60 percent as compared to bottled mineral water. It delivers delicious filtered water chilled to the perfect drinking temperature in three options – still, medium or sparkling – at the touch of a button. “We are overjoyed at this accolade and very proud. To be the only decorative plumbing company to appear in the international ‘Change the World’ ranking is a great honor for us. Sustainability has always been an integral part of our company’s DNA. We will continue to contribute to sustainability with our innovative products and technologies, so that future generations will also have the opportunity to experience the ‘Pure Freude an Wasser’ without worries”, said GROHE CEO Michael Rauterkus. Earlier this year, the company was awarded the CSR Award of the German Federal Government for particularly sustainable business. To learn more about GROHE products or find a GROHE retailer near you, visit www.grohe.us or call (800) 444-7643. GROHE Blue® is a registered trademark of GROHE AG.